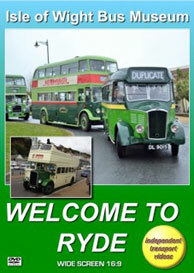 The Isle of Wight Bus Museum has now moved into its new home at the former Southern Vectis bus depot in Ryde. Well known for its Spring and Autumn Running Days the museum is home to a superb collection of buses and coaches, mostly with Isle of Wight heritage. independent transport videos have been involved with the Museum since it’s inception back in 1997, producing a number of video programmes featuring it’s Running Days as well as programmes featuring the contemporary Southern Vectis buses. This DVD is produced as a ‘welcome’ to the new premises, featuring the special Members Open Day in March 2015, prior to the public launch of the Museum, the Autumn Running Day of 2015 and the Spring event of 2016. We begin this programme at the Members Open Day on the 29th March 2015. The day was not the best for the weather! Storm force gales that affected the ferry crossings from the mainland and rain were all too present. The main highlight of the day was a cavalcade of thirteen buses and coaches from the Museum taking a tour through Seaview and Ryde. Our cameras were on board 703 (DDL 50), the 1940 K5G open topper – not the best camera platform judging by the weather! However it turned many heads of the hardy souls that were out enjoying their Sunday afternoon! We also take a brief look inside the depot – a superb facility, we are sure you will agree. The second part of the programme features the 2015 Autumn Running Day. This event actually took place back on the Quay and at the new Museum! There were over 20 different preserved major fleet liveries on show at this event, not to mention over six independent companies! Operators included Badgerline, Hants & Dorset, Wilts & Dorset, Eastern National, Crosville, Midland Scottish, Ulsterbus, Belfast Citybus, Portsmouth and Southampton Corporations to name but a few. Plenty of action for you to enjoy as the buses run in and out of the ‘bus stations’ at the Quay and the Museum. Our final visit is to the Spring event in 2016. This event actually ran over two days, our cameras were there on the Sunday to enjoy the comings and goings at the Museum. 2016 sees the celebration of 60 years of summer season open top buses on the Island. To mark this we take a ride out on 703 (DDL 50) to Ventnor via Shanklin, returning via Sandown on this beautiful old bus. Lovely sounds of the Gardner 5 cylinder engine from the lower deck and nice views of her running along the sea fronts at Shanklin and Sandown. We return to Ryde and see some preserved buses running along the esplanade amongst the modern Scanias and a brand new Enviro400 belonging to Southern Vectis. We hope we have whetted your appetite for a visit to the new Museum, whose address is: The Bus Depot, Park Road, RYDE, Isle of Wight, PO33 2BE. Enjoy!